Halloween is about letting the kids have some fun. Of course, just because the kids get a little older they don’t seem to outgrow the desire to have a little bit of haunted fun! What about the grownups? Should they be denied a bit of Halloween fun? Not according to Eve Arden as Our Miss Brooks. To be fair, Principal Osgood Conklin, played by Gale Gordon, may not agree with those sentiments. We must remember that Mr. Conklin has been under an enormous amount of strain lately. Who wouldn’t be with the responsibilities that a high school principal faces? When you add that to the trials of raising an attractive teenage daughter like Harriet, well… What Mr. Conklin needs is a quiet weekend up at Crystal Lake where it is quiet and soothing. Thank goodness Halloween falls on Saturday so that he can get away from all that silliness. Luckily for Harriet, her friends Walter and Stretch decide to hold a Halloween Party on Friday night. The only problem is where to have the party. What would be wrong with having it at Miss Brooks’ house? Everything! At least, until Miss Brooks discovers that the good looking biology teacher, Mr. Boynton (played by Jeff Chandler), is coming. Then a party at Connie Brooks’ house is a wonderful idea! This entry was posted in Eve Arden, Our Miss Brooks and tagged Eve Arden, halloween radio show, Our Miss Brooks. Bookmark the permalink. 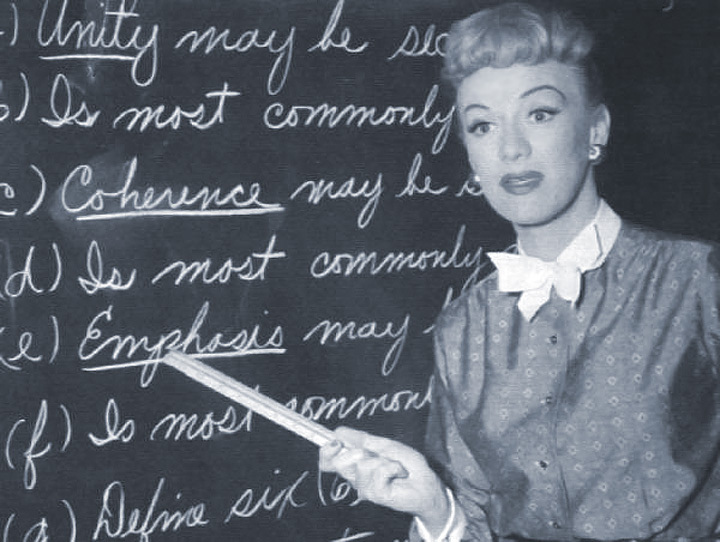 the day we never missed “Our Miss Brooks.” She was my vision of a dream teacher. I loved her! She had the most distinctive female voice on (and off) the radio. You always recognized her voice.